Fishing Port Stephens. Port Stephens fishing. Johnno's Getaways Beach Fishing 4x4 Tours, Beach Fishing, Rock Fishing, Stockton Beach, Port Stephens, Stockton Beach, 4wd tours, 4x4 tours, charter fishing, charter boats, tourist info and local websites. All tours include: 4x4 travel - 13 seat 4WD - all fishing gear , rods , tackle , bait , fishing licences. fishing equipment, bait & refreshments for 4 hours fishing. G'day , Johno here again. Well, we're at the time of the year where the weather is all over the place. One day it's fine and warm - the next it's wet and blowy. The seas are as flat as a pond, the next day it's up and rough. Anyway if you're keen, there's no such thing as bad weather to fish. Speaking of which, tailor numbers are thinning out down here on the Novacastrian coastline, the 'big ones' by now should be at their holiday venue, doing what they do. The top end of Fraser Island would be tops right now! 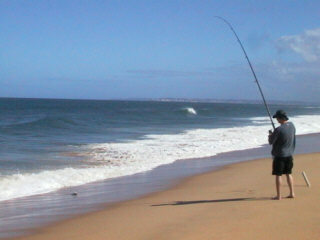 Locally, small numbers of tailor are being taken along Stockton Beach. This species can usually be taken around these parts most of the year. Size and numbers are the only thing that changes. Bream are making their appearance on the beaches just about now. Some good fish have been landed around the Sygna. For those of you that are not aware of what the Sygna is, it's the front half of a ship which broke-up and ended up on our shore. Salmon are still doing the rounds, these fish are on average 2.5 - 3 kg. Salmon are fish who for their size have got some ticker. School's in for the jew - school jew that is. Fish to 6 kg are to be had. A 13 kg. monster was extracted from Stockton Beach during the week. Newcastle Harbour is fishing well along the Stockton side breakwall. Tailor are turning up on dusk. Blackfish and groper are being taken along the same side. School jew are further up the harbour. Swansea Channel is worth a go. 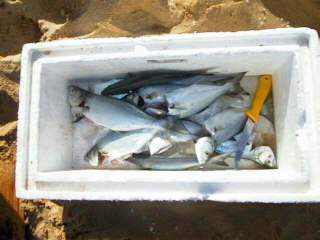 Tailor and bream along the beach side wall , while closer to the bridge kingies are on the bite on fresh squid. Remember, to fish is fun, to catch one is a bonus! Johno jumping around behind the Troopy. Would you kiss a face that looks like this??? The fish is pretty 'orrible too! Germany's answer to Rex Hunt scouting the water for the best spot! Hehehe heh heh - come here little fish ... Johno sizes another one up. Yep! Here's another one that didn't get away. About a 2-3kg salmon caught from surf at Stockton Beach by Dakiush Mohandes from Sussez, England with Harold Von Finster from Minmi, Sydney with Johno and Vicki. the boys were here on the am shift and hooked a 6ft sand shark twice but it got away. Hey - it's not a story! Better half and I were walking along the beach and saw the shark in about waist deep water in a gutter just in front of where Johno's crew were fishing! Copyright ©1999 JG Web Link/Dunesnet.com. All rights reserved.